I saw the question (in Filipino) on a discussion thread in an internet forum called Pinoyexchange.com. It asked why Filipinos are not rich. I don’t post there however I’d like to explore the idea of being rich. How does one define “rich” or being “rich?” Must we put a dollar figure to determine which individual is rich or not? Anyway, for discussion’s sake, Merriam-Webster defines the word rich as, just to name a few, (1) having abundant possessions and especially material wealth, (2) having high value or quality, and (3) well supplied or endowed. For me, being rich is really just a state of mind. People equate being rich as being successful, content and having a high quality of life. If people think that way then it is like saying money buys happiness, which seems very materialistic. People say they want to be rich but really all they want is to feel successful, content and enjoy a high quality of life. If we define conentment and success just by being materially rich then the four to five billion of us who do not belong to the 10 million who are worth a million dollars or more are misarable but I’m sure we’re not. Some very wealthy people can even be the most disturbed, the most disgusting and the most immoral. The many Catholic religious people I know who took the vow of poverty and are celibate seem happy and content serving God and the needy. My grand mother, a sari-sari store owner who died last year seemed happy and content to know that her children are living comfortably. The truth is not every one will become a highly paid singer, actor, artist, dancer or athlete. Neither will all of us become successful businessmen or entrepreneurs. We must accept that fact however, not achieving those aforementioned is not terrible at all. There is nothing wrong with creating and seeking material wealth as long as the means are legal, moral and ethical. However, society and media should stop measuring a person’s success by their net worth. We should all strive to acheive a better quality of life for all. In the end, people should really do some soul searching in finding out what really would make them happy, content and provide a high quality of life in order to feel “rich.” In the end, when we all die people will remember us more on how we touched their lives and not how wealthy we were. 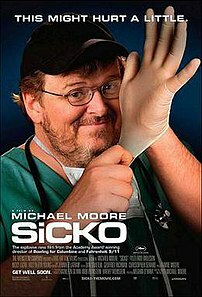 Above is the official trailer of the latest Michael Moore documentary, Sicko. This movie is the third that the controversial director and writer has done. It discusses the state of health care in the United States of America. The film basically is campaigning for a universal health care system for the USA. A few hours ago I had a rare chance to see the entire movie. I find the movie very interesting and shocking. I cannot believe that in the world’s most powerful and richest nation its people cannot have the best medical care without paying an arm and a leg. Compared to other developed nations and Cuba it seems that Americans are worse off. The Philippines has a similar system like the US wherein the user or patient pays for health care. The system is bad for those with low incomes because they end up taking huge loans just to pay for medical expenses and end up worse off in trying to pay debts. We do have a national health insurance called the Philippine Health Insurance Corporation (Philhealth) however it does not pay for all expenses. It is hope that the film can spark debate and action in improving health care not just in the USA but also in the Philippines.